Without naming the news organisation, Thai police spokesman Lt Gen Prawut Thavornsiri said it belonged to a Malaysia-born woman who moved to Britain. He said the news outlet had tampered with the documents with the intent of discrediting Prime Minister Datuk Seri Najib Razak and his administration. Speaking to the New Straits Times, he said the woman was part of a group of potential buyers interested in purchasing the documents from Swiss citizen Xavier Andre Justo. “Some members of the group, including the woman, had met with Justo three times in Thailand to determine whether the information contained in the documents was of any use to them,” he told the NST in a phone interview today. Prawut is believed to be referring to Sarawak Report founder and editor Clare Rewcastle-Brown, a British national who was born in Malaysia. He also said Thai police had strong reason to believe that the documents were tampered with after the transaction. “The information contained in the documents that were published online appear to be different from the original digital copies retrieved from Justo’s personal computer,” he said. He also said the same group had met with Justo at least once at a hotel in Singapore. “We have strong evidence to support alleged meetings and we can confirm that they did take place in both countries,” he said. He added that the group comprised prominent figures from the Malaysian opposition, government, and media. Prawut said after negotiations concluded, a chat group was created on social messaging service WhatsApp to discuss the terms of payment. “After they agreed on the selling price, they signed a contract whereby Justo would sell a ‘software company’ to the group. And the remaining money from the ‘purchase’ would be used to pay Justo,” he said. Prawut said this was similar to a money laundering tactic commonly employed by criminal gangs. “All this information was found in the group’s WhatsApp chat records. We managed to download the full transcripts from his cellphone memory card and printed copies,” he added. Prawut said Thai police were ready to share this information to their Malaysian counterparts. “I am also of the opinion that a case should be opened in Singapore as the money laundering started in that country. ” He said Thai police were willing to share the information with their Singaporean and Malaysian counterparts if they asked for the evidence through foreign protocol. Yesterday, the NST quoted Prawut as saying that an opposition leader and a media tycoon had met with Justo in Singapore before the latter sold the confidential documents to a news outlet based in London. He had said Justo denied having tampered with the documents, adding that immigration and hotel records gathered by Thai police corroborated Justo’s account of the meeting. Although Prawut was careful not to mention the individuals by name, sources indicated that the politician was a DAP member of parliament. The other two individuals were a publisher and owner of a Malaysian media group, respectively. 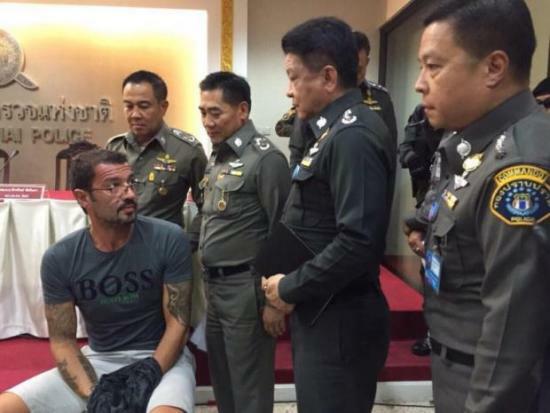 Justo has been under Thai police custody since his arrest late last month after he allegedly stole thousands of emails and documents from Petro Saudi, and tried to blackmail his former employer. He moved to Thailand after he was terminated from the company. Thai police are investigating how, after leaving the company, Justo issued a series of blackmail demands for 2.5 million Swiss francs (approximately RM9.9 million). PetroSaudi did not meet Justo’s demand. Then in February this year, doctored and tampered versions of the emails suddenly started to appear on Sarawak Report, sparking a political row implicating 1Malaysia Development Bhd (1MDB) and Malaysian leaders. On Wednesday, a former Sarawak Report editor allegedly confessed to assisting the online portal’s founder, Rewcastle-Brown, in falsifying documents for use in news reports in a bid to topple prime minister Najib through the 1MDB controversy. The confession, said to be made in a video recording, detailed measures taken to defame Najib and 1MDB, including claims that Rewcastle-Brown had fabricated facts related to 1MDB, Najib, his wife Datin Seri Rosmah Mansor, his stepson, Riza Aziz, and PetroSaudi International. It also revealed the involvement of several prominent opposition leaders in the conspiracy and a number of British nationals, in addition to Rewcastle-Brown.